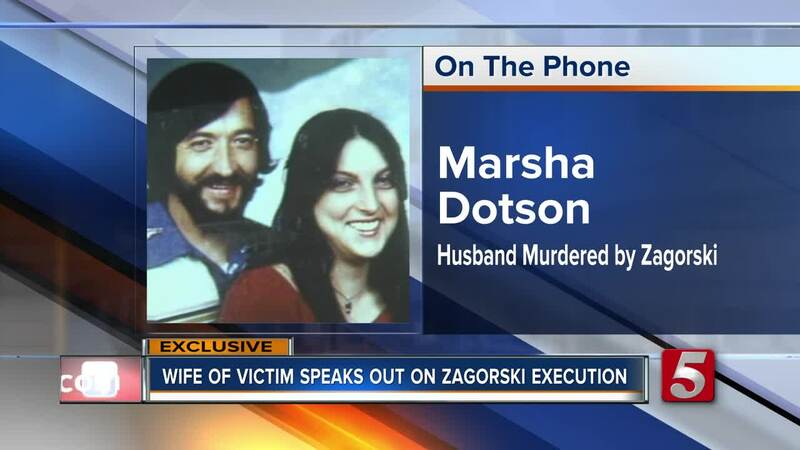 It's been 35 years, but the fact that Edmund Zagorski murdered Marsha Dotson's husband in April of 1983 still haunts here every day, and she hopes she'll get some closure following Zagorski's execution, which is planned for Thursday. The murder of John Dale Dotson and Jimmy Porter happened in April of 1983. Zagorski convinced the men that he would sell them 100 lbs. of marijuana, when in reality, he had no plans of selling the drugs, just taking the money. When the deal was supposed to go down, Zagorski shot the two men, slit their throats, and stole their money before fleeing. He later had a shootout with police before being taken into custody. To this day, Marsha Dotson still remembers her husband as the man she loved. She never remarried. “Dale was a good man. He had a good heart, he was a good provider, he took care of me and my family," Marsha said. For Marsha, it's hard to figure out why her husband was killed. She said while she knows it was about the money, she thinks the murders were unnecessary. Now 35 years after the murders, Zagorski is expected to be executed by the State of Tennessee on Thursday. While family of the victims are invited to watch the execution take place, Marsha will not be there. “I just don’t care anything about watching that, that’s nothing that I care to watch," Marsha said, adding that her son will be there to watch instead. Marsha said she has been having mixed emotions about the execution. On one hand, she wants the person who took her husband away to pay, but on the other hand, she said she forgives Zagorski. According to Marsha, she sent a letter to Governor Haslam asking for him to change Zagorski's sentence to life in prison without parole instead of death by execution, but with Governor Haslam declining to intervene, she said she's ready for the execution to take place. Recently many have questioned whether lethal injection is humane. A challenge in the State of Tennessee went all the way to the Tennessee Supreme Court, but they did not rule in favor of the inmates on death row, meaning the executions can continue. When asked about lethal injection, Marsha said it's more important to think about the victims and what happened to them, rather than the person who murdered them. Marsha said she hopes she gets closure and will have the ability to move on more than she has until this point after the execution goes through, and she hopes that others in her situation will be able to have relief quicker than she has been able to. “When these horrendous crimes happen, and these men are given or women are given the death penalty, it needs to be carried out then so the families can have some closure instead of it lingering on for 30-some odd years," Marsha said. Zagurski is scheduled to be put to death at 7 p.m. on Thursday.